Mahabalipuram, A town in Kancheepuram district in the Indian state of Tamil Nadu. It has an average elevation of 12 metres (39 feet). It also called Mamallapuram. Mahabalipuram was a 7th century port city of the South Indian dynasty of the Pallavas around 60 km south from the city of Chennai in Tamil Nadu. The name Mamallapuram is believed to have been given after the Pallava king Narasimhavarman I, who took on the epithet Maha-malla (great wrestler), as the favourite sport of the Pallavas was wrestling. It has various historic monuments built largely between the 7th and the 9th centuries, and has been classified as a UNESCO World Heritage Site. The temples of Mamallapuram, portraying events described in the Mahabharata, built largely during the reigns of Narasimhavarman and his successor Rajasimhavarman, showcase the movement from rock-cut architecture to structural building. The mandapa or pavilions and the rathas or shrines shaped as temple chariots are hewn from the granite rock face, while the famed Shore Temple, erected half a century later, is built from dressed stone. 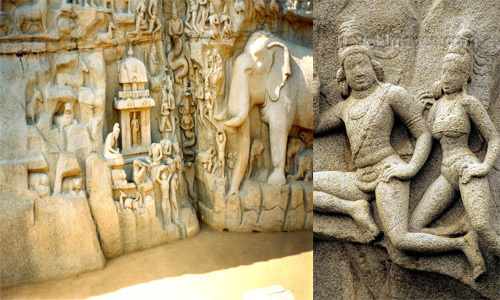 What makes Mamallapuram so culturally resonant are the influences it absorbs and disseminates. The Shore Temple includes many bas reliefs, including one 100 ft. long and 45 ft. high, carved out of granite. Referring to Narasimhavarman's victory in AD 642 over the Chalukyan king Pulakesin II, Brown says the Pallava king may have brought the sculptors and artisans back to Kanchi and Mamallapuram as 'spoils of war'. 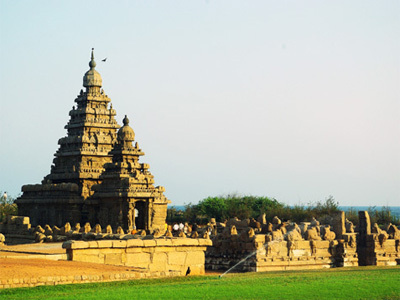 The modern city of Mahabalipuram was established by the British in 1827.